I really am loving stitching this piece. Not too much of any one thing for me to lose my way and get distracted. YAY! for me. Yesterday was the second installment of the Wild Salmon Mystery and it is coming along. 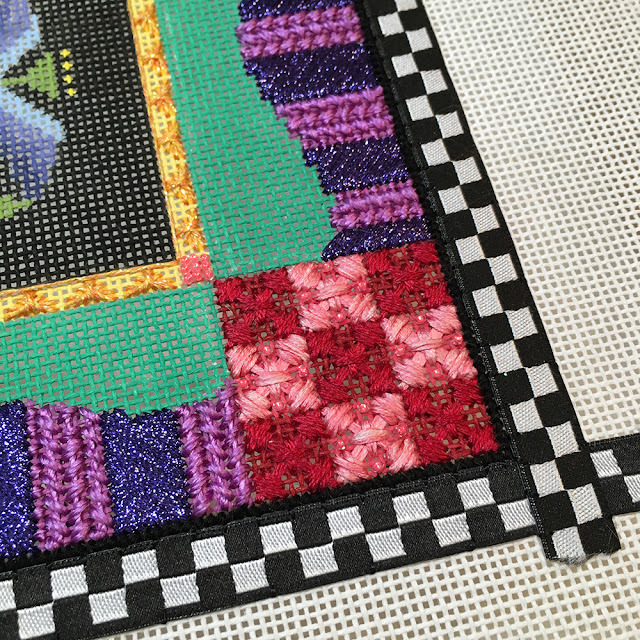 Our focus was again on the borders, creating a fun little triangle pattern for the inner border and a bold Rice Stitch Variation pattern for the checkered corners. How can you go wrong combining Soie d’Alger, Straw Silk and beads in a pattern. Three of my favorite things. 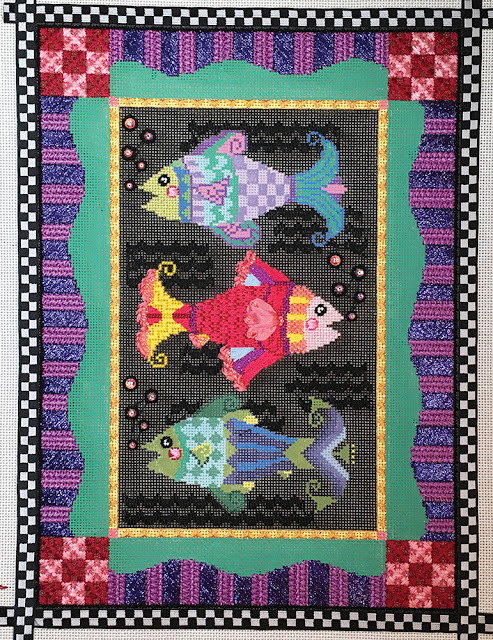 We also stitched one fish. The pink salmon. He’s a cutie with just a touch of ribbon and fun neon lined beads. Don’t you just love their puffy cheeks? If you’ve been thinking about this class but haven’t taken the plunge because you wanted to see what I would do, now’s your time to join the fun. I still have a few canvases in stock so we can ship quick. This canvas will go on hiatus for 4 weeks while we have a few big classes. You will have plenty of time to catch up! Kinga Nichols will be arriving Friday to teach three fabulous bead embroidery projects and then two weeks later I will be teaching my embellishment class. 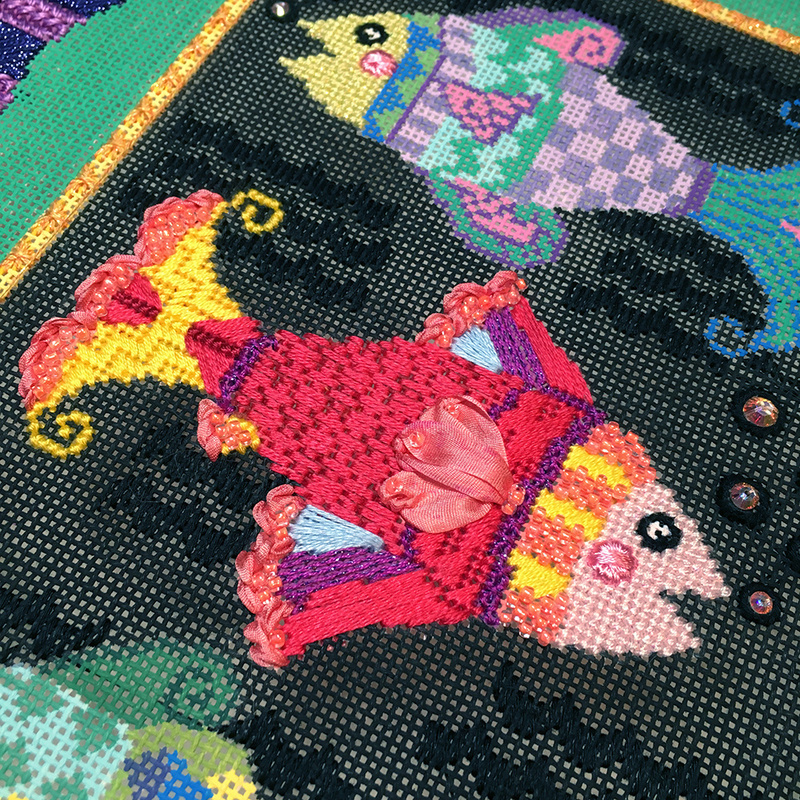 Eight fun canvases will have new stitch guides. There’s something for everyone in this batch. Melissa Shirley, lulu mypinkturtle, Share One’s Ideas, maggie, Sharon Hendy-Moman, Laurel Burch and one of my canvases! Woo Hoo! You girls spoil me with fun canvases to guide. « Previous: What?! I finished the book!